Just moments away from the prestigious Amendoeira Faldo and O’Connor golf courses and with an excellent range of facilities, the Amendoeira Golf Resort offers a first class stay in Portugal. The Amendoeira Golf Resort offers a mix of luxury villas and apartments situated in an idyllic location, nestled away in the Monchique Mountains and just a short drive away from the coast. The Amendoeira Golf Resort is located just a 15-minute drive away from Silves, a beautiful traditional Portuguese town exuding culture and charm. Silves is the perfect destination for those looking to escape the hustle and bustle of the typical resorts in the Algarve to try a taste of the ‘real’ Portugal. Silves is not a large town, meaning all of the historic attractions such as the ancient castle can be accessed on foot. With an array of local cafes and traditional restaurants, here you can truly embrace a true Portuguese lifestyle. Furthermore, just a 40-minute drive away from Faro Airport, the Amendoeira Golf Resort is highly accessible for all travellers in the area. Conveniently for golfers, the Amendoeira Golf Resort has two spectacular golf courses on site; the Amendoeira Faldo golf course and the Amendoeira O’Connor golf course. 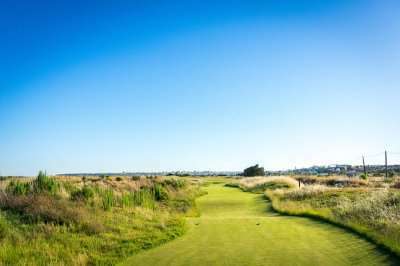 Both of these golf courses are widely considered to be among the most prestigious in the Algarve, meaning they are an essential on any itinerary for an unforgettable golf escape in Portugal. The resort’s accommodation exterior is based around a Moroccan theme and offers the most stunning accommodation for a luxurious golf escape. The apartments are modern in design and furnished to a high standard with fully equipped kitchens, large living areas and flat screen televisions with a full range of satellite channels. All villas and apartments here take full advantage of its stunning location by providing sweeping views over the neighbouring Amendoeira Faldo and O’Connor golf courses. The Amendoeira Golf Resort was just constructed in 2012 and is host to some of Portugal’s best sporting facilities. The resort is home to an array of fantastic leisure facilities to keep each and every guest entertained. Guests can enjoy full access to a fully equipped fitness and spa, multiple football pitches, and tennis courts. The hotel also offers a floodlit academy course for its guests to practice for the two challenging Amendoeira golf courses. Whilst the villas and apartments at the Amendoeira Golf Resort are self-catering, guests can order a starter food pack upon arrival. Alternatively, guests can venture to the golf clubhouse for breakfast, lunch and dinner, as well as a range of alcoholic drinks to be enjoyed with the views of the stunning Amendoeira golf courses.